In 2050, the circular economy has become the norm in the big advanced economies. A new generation of political leaders has pushed forward a series of reforms that focus on increasing sustainability, not only in the raw materials industry. Almost every product is produced in an environmentally-friendly way with the aid of green technologies. The civil society puts sustainability above everything else to keep deposits for future generations. Severe environmental problems have reached a tipping point, Governments agree to place sustainability above growth and profit. Recycling and substitution technologies have reached a new level of maturity. Prices for secondary (recycled) material fell over time. Only high-tech, low-impact mining is tolerated. Consumers reward resource-efficiency, waste reduction and durable products. Sophisticated environmental monitoring, prevention and mitigation technologies are being deployed. Given the emergence of severe environmental problems, the biggest economies have come to a tipping point. Starting with the ratification of the climate change agreement by the U.S. and China in 2022, a political consensus was reached that a new, distinctly “green” approach was needed. Whether industrialized, resource-rich, or developing country – there is an unprecedented consensus that sustainable development is a must. Virtually all governments agree to place sustainability above growth and profit. Concerted actions by governments and the industry incentivized the shift towards more sustainable approaches to provide and use raw materials. In 2050, hydro-carbons are mainly used as raw materials, not as a source of energy anymore. Governance is the key in this scenario. The changes have encompassed a transformation of other industries, too. Agriculture, the energy sector, logistics, infrastructure etc. needed to be transformed to provide sufficient resources for a growing world population in a sustainable manner. Such change in the raw materials sector was only possible because prices for secondary (recycled) material fell over time. They became more attractive relative to primary extracted material. Trade with secondary raw materials has increased dramatically. A truly circular economy has become reality in many aspects. Advanced western economies help to raise the mining standards in developing countries. Efficient and environmentally-friendly trade is the overall goal, including higher levels of transparency, equal access and fair trade. Strong independent institutions reduce the risk of raw material black markets. The shift towards green technologies generated its own economic growth, as spendings in research and innovation increased to develop green technologies, to fight environmental degradation, climate change etc. For instance, carbon dioxide has become an asset, it can be recycled to create synthetic fuel. Mining companies want to benefit from the boom in secondary raw materials. Some of them acquire recycling companies, others have turned into vertically integrated RM companies, which produce further down the value chain. By doing so, they lower the risks of the volatile mining market. Green technologies, in turn, require raw materials. Often these raw materials are regarded as critical. An entire generation has grown up to be environmentally aware and has developed a sustainable lifestyle, assimilating practices which are not based on the ownership of tangible products. Companies sell usage and service rather products. Corporate planning aligns commercial with sustainability goals. The overall public perception of mining tends to be negative, based on historical disasters. Despite this situation, society understands the need for minerals and mining, and accepts the need for the production of primary minerals until substitution technologies have reached a new level of maturity and potential. Manufactured products now have to carry a label that specifies the origin of the (raw) materials used. Consumers prefer locally-produced products. Only high-tech and low impact mining is tolerated. Mining at new frontiers is a sensitive issue, tolerated by the public, but under continuous scrutiny by decision makers and environmental organisations. New technologies allow for more accurate exploration and new mines are opened, some in rather remote (uninhabited) and/or deep (depth at > 5000 m below surface) locations. Efficient processes along the whole raw materials value chain can be observed (e.g. less waste, less energy consumption). A bigger portion of innovation efforts is focused around resource efficiency, extended product lifetimes and waste reduction. 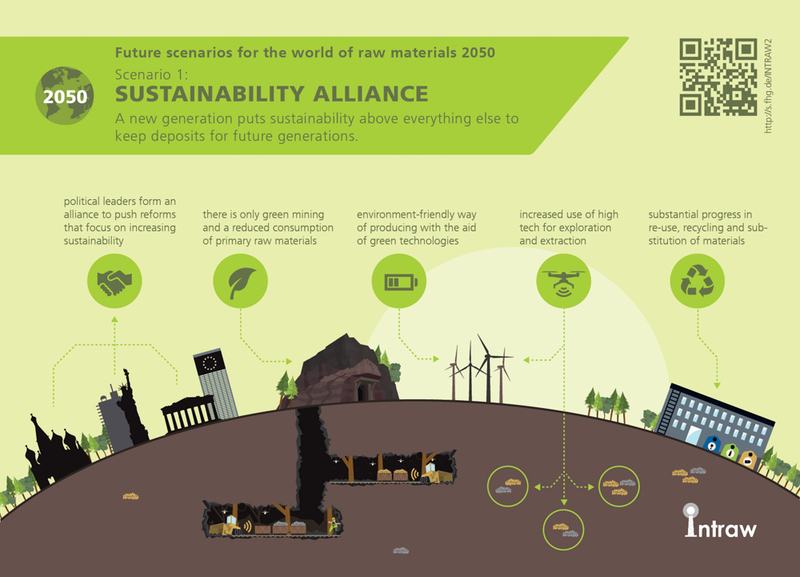 New technologies are developed that accomodate the demand for raw materials from the reuse/recycle/substitution perspective. Recycling at the atomic level is the ambitious goal. Sophisticated environmental monitoring, prevention and mitigation technologies are being deployed. Compliance with the strongest environmental standards is now the biggest share of running costs in mining operations. Mine remediation is given priority. Mining in extreme environments have become standard practice, but also a subject to continuous discussion and debate. Lessons learned from past environmental incidents have been transposed to these new environments in an effort to avoid future accidents.